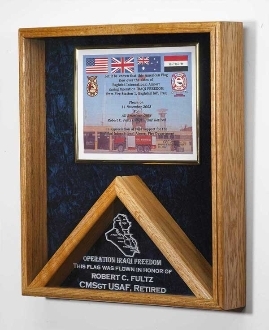 The Large Military Flag and Medal Display Case - Shadow Box is the ultimate solution for those who want to create a perfect display for your 3ft x 5ft flag and accompanying certificate or medals. This is ideal for the storage of flags flown over the Capitol, along with certificate of the achievement. This Large Military Flag and Medal Display Case - Shadow Box is available in either cherry or oak, and has a glass front with turn-button closures on the back of both the display and the flag case compartments. The attractive shadowbox is used to house awards, medals, photos and other valued mementos. As an oversized fixture to hold what is dear to you – such as use as an Army flag display, a Navy flag display, a Marine Corps display, a war medals display case, or a memorial flag display – this cabinet comes with an 18-in. x 20-in. Certificate Combination Case and holds a 3ft x 5ft folded flag, which can be purchased as an option. A crushed velvet background makes your treasures stand out above all else. This box is designed to be hung on the wall, but it can be placed on a shelf if so desired. This product can also be ordered with optional laser engraved map or service emblem on the glass, as well as up to seven lines of personalized text. Our items are crafted in genuine hardwoods, material as durable as it is attractive. Oak and walnut are strong, durable wood that holds its shape well. Our hardwoods are an excellent choice for woodworking that stands the test of time and good taste. Buying a flag display case from flagsconnection.com means you are buying a top-quality piece, crafted so well and made from such fine materials, it is sure to be appreciated from generation to generation as a family heirloom.